French fashion designer Yves Saint-Laurent once said, “The most beautiful makeup of a woman is passion. But cosmetics are easier to buy.” Year-by-year, women around the world testify to Saint-Laurent’s words…with their spending. What are the Makeup Preferences, Behaviors of Women? Field Agent recently conducted a survey of 500 women across the country. Our purpose was to understand how women shop for and use beauty products, especially cosmetics. 1. Which retail categories fare best with women in search of cosmetics/facial skin care…and why? Mass merchandisers topped the list, with 38% of 500 female respondents saying they purchasemost of their makeup from big box stores like Walmart and Target. At 23%, good enough for second place, specialty beauty retailers (e.g., Ulta, Sephora) are also drawing plenty of shoppers these days. Women gave us basically the same reasons for mass merchandisers and drug stores: they like their prices, selections, and convenience. As one 29-year-old from San Jose, CA said, "I purchase most of my cosmetics from [mass merchandisers] because they have the best prices and usually have a great selection." Yet those who purchase the majority of their makeup from specialty beauty retailers cited variety/selection (not price) as the top reasons, with quality not far behind in second place. A 27-year-old woman from Rothschild, WI explained it this way: "[Special beauty retailers have] good quality makeup with a lot of variety to choose from." To answer this question we asked respondents, “Which retailers do you purchase beauty products from?” They were allowed to choose multiple options. Please note that this question asks about beauty products in general, not cosmetics specifically. Mass merchandisers Target and Walmart dominated the competition, with 66% of respondents claiming to purchase beauty products from one or both retail juggernauts. The top 10 was rounded out by: Walgreen’s (46%), Ulta (44%), CVS (42%), Sephora (37%), Macy’s (23%), Amazon (19%), Kroger (11%), and Rite Aid (11%). See also the reasons women use and don't use self-checkout for buying groceries. 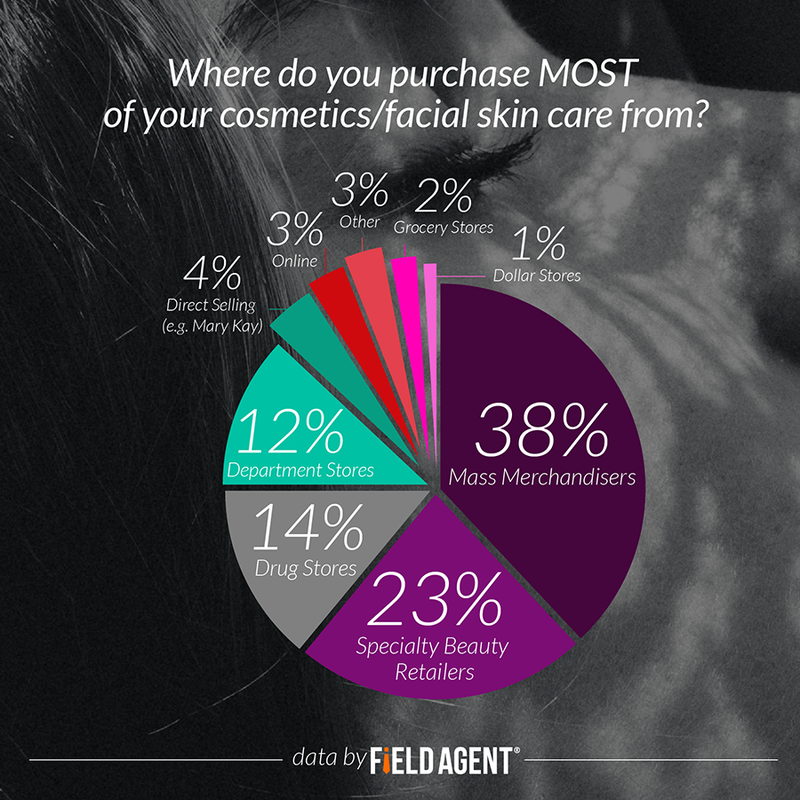 Field Agent specifically asked women, who generally weren’t enthusiastic about shopping for cosmetics online, what barriers prevent them from purchasing more of their makeup and facial skin care from online retailers. We presented them with eight potential reasons why online shopping may not be ideal for purchasing cosmetics. More than half (54%) said they need to be able to match their skin tone (or other cosmetic shades) when buying makeup. No other reason garnered responses from more than half of the sample, but two came close: “I prefer to see/touch the product before buying it” (48%) and “Cost of shipping makes it more expensive to purchase online” (40%). Few packages are as full of marketing messages as beauty product containers. But which label claims truly resonate with female shoppers? 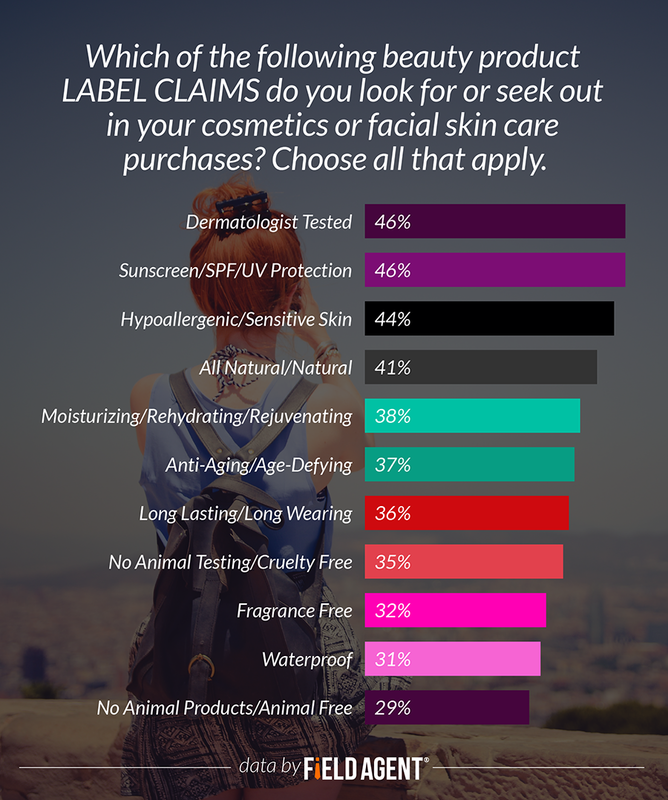 We presented our sample with 25 common makeup label claims—from “all natural” to “anti-aging” to “waterproof.” There was a tie at the top, with 46% of respondents saying they look for or seek out “dermatologist tested” and “sunscreen/SPF/UV protection” when buying cosmetics. See the graph for results on other label claims. Now we get into the critical values-driven questions. Where 1 was most important and 5 least important, we asked women to rank five potential priorities when shopping for cosmetics. Color and Quality distinguished themselves as the most important priorities among women. In all, 56% of women ranked Color as a #1 or #2 priority, while 54% ranked Quality as #1 or #2. 7. And why do they do it? That is, why do women shop for, buy, and wear cosmetics? It all depends on the makeup category. Truly it does. For example, over half of female respondents (54%) said they are loyal to a specific brand of foundation, while only 15% said they are loyal to a particular brand of lipstick. 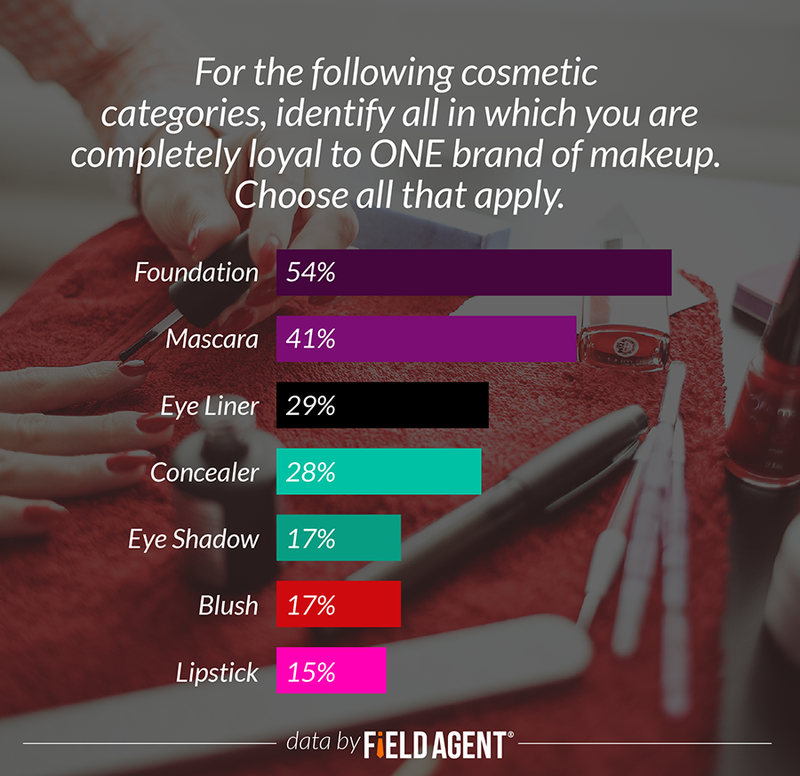 The graph shows loyalty measures on other makeup categories. Field Agent is the leader in on-location audits and research. Through mobile technology, we allow companies to be with their customers...wherever they are. For this survey we asked 500 women to take pictures of the inside of their makeup drawers, as the sample photos below illustrate. 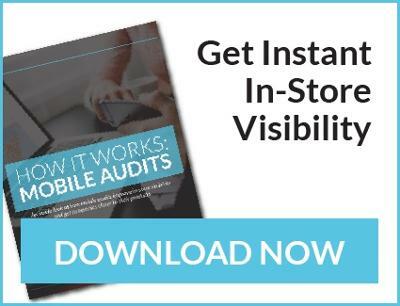 Whether you’re in need of display audits, price checks, mystery shops, shopalongs, or a wide range of other audit and research services, we’ve got you covered. 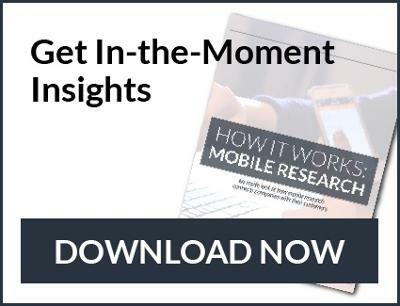 Download one or both resources in our How It Works series to explore the fast, affordable capabilities of Mobile Audits and Research.